The President of the Philippines delivered his annual speech (S.O.N.A) for his countrymen. This full text transcript in English translation was made specially for foreign readers and other use. President Benigno Noynoy Aquino III delivered his S.O.N.A at exactly 4:00 pm today and with live telecast at Batasan Pambansa Complex in Commonwealth, Quezon City. This is our fourth SONA. When I was a congressman, the people of Tarlac were my strength. When I became a senator and until now, in my Presidency, the people of our country have been there. Philippines, you are my strength. As we continue doing our part—and as we continue placing faith in our fellowmen and in God—I tell you: It will still be you who will make certain that what we have begun here will continue; you will be the ones who will make sure that we will completely eradicate corruption; you will be the ones who will make sure that we will never again stray from the straight and righteous path. 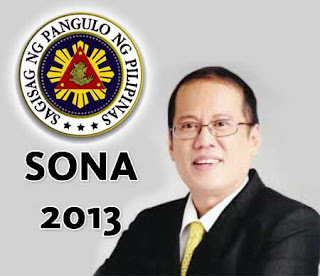 Comments or suggestions about "President Aquino SONA 2013 Full Text Transcript (English)" is important to us, you may share it by using the comment box below.